Ethiopia Reads News: Announcing the New Shola Children's Library! Announcing the New Shola Children's Library! 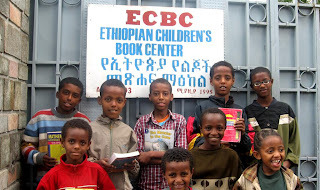 Ethiopia Reads is thrilled to announce the new home of Shola Children's Library in Addis Ababa, Ethiopia. Located within walking distance of the original Shola, the new library has more rooms, more furniture and more room for the thousands of boys and girls who visit every month. The library is well-equipped to house Shola's growing collection of more than 15,000 books, and is also home to a growing roster of programs in art, drama, poetry and book-making. Originally opened in 2003, Shola Children's Library is the first free public library for children in Ethiopia. In 2007, children made more than 60,000 visits to the library. The library is supported by the Global Fund for Children, James and Teresa Mitchum of Leawood, KS, and hundreds of donors across the country. Read more about the new Shola in the latest issue of The Ethiopian Bee, published by our staff in Addis Ababa. This is nice information.... Very interesting. Thanks very much for sharing such an awesome blog post, Thanks!